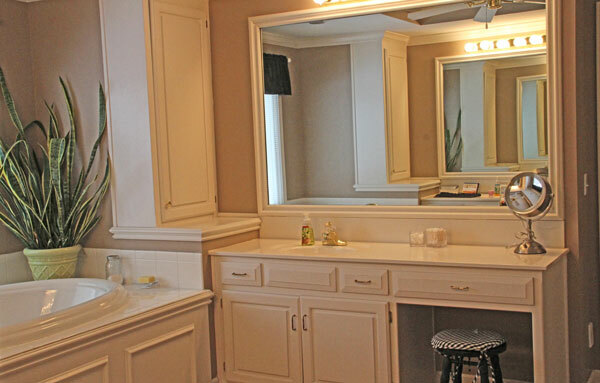 One thing I have always loved about my master bathroom, besides the fact that it is very spacious, is that I have my own space. My own sink, my own cabinets and my own drawers. I have never been one to share very well. That has certainly happened around here so I have decided to start a dejunking/spring cleaning party at this house. The first stop is the drawers on my side of the master bathroom. 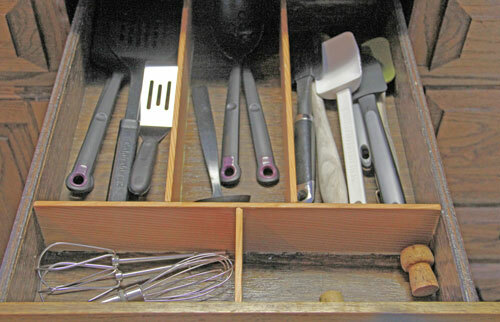 Several years ago the MR. installed these kitchen drawer dividers after seeing similar dividers that my sister had at her house. I love them. On multiple occasions I have mentioned to the hubby that these same dividers would be great in my bathroom drawer but he never took the hint. 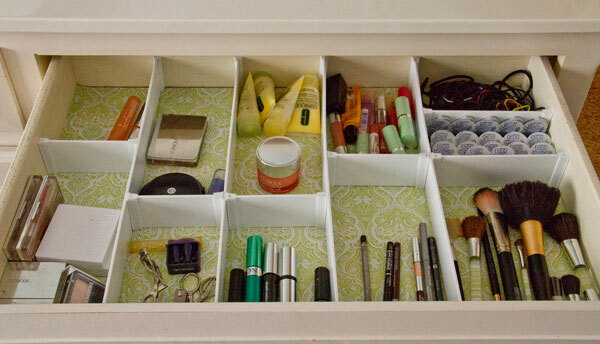 Last week when I read on Simply Organized about some DIY drawer dividers from the Container Store, I decided to take matters into my own hands and I ordered two sets. They arrived just in time for me to take advantage of a snow day and be productive. 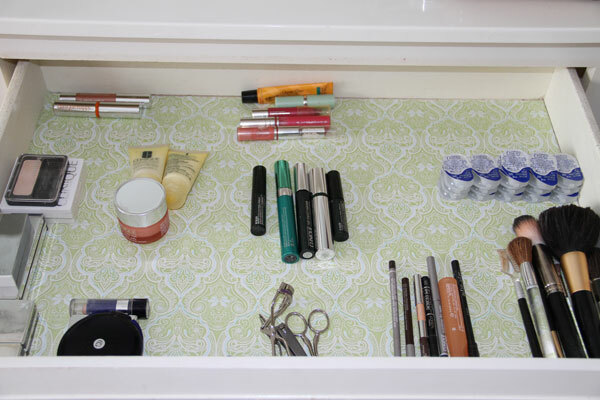 I emptied my bathroom drawer, installed some pretty new liner paper and laid out the items from the drawer in groupings that I thought would work. The installation for the dividers is pretty easy. 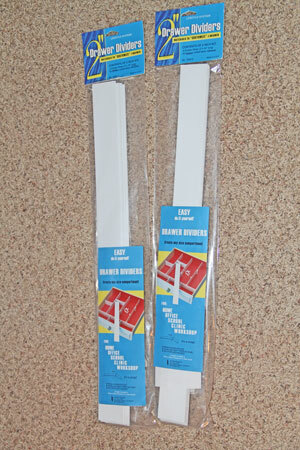 You measure the length of divider you need (less 1/4″ for the mounting brackets), score the plastic strip and snap it. Then you slide the strip into the self-adhesive mounts into whatever configuration you want. It took me about an hour to complete this project and I am SOOOOO happy with it. 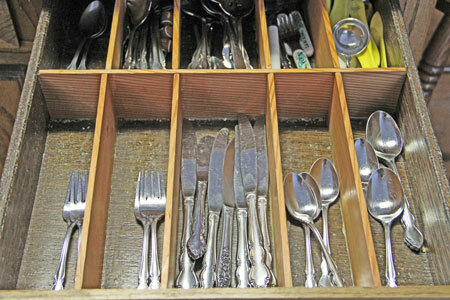 Every time I walk by that drawer I open it and gaze inside. 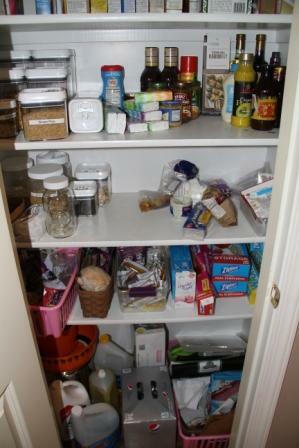 There is just something about these divided areas with like items having their own space that takes this structured person to her happy place! 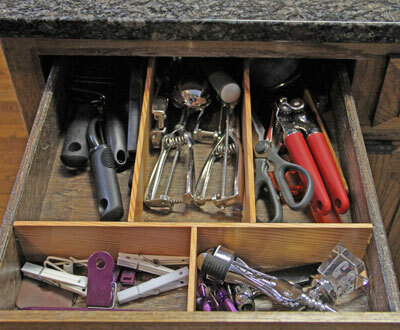 It only took one package ($17.99) to complete this project which means I have one left to tackle another drawer in this house, be still my heart :). Every year at this time I start organizing my life through a calendar planner. I have experimented with many types including Franklin planners, Day-Timers, electronic calendars on my pc and phone and last year I even created my own planner in a bound leather journal. One thing I have learned over the years is that I like to write things down. I do enjoy the convenience of an electronic calendar and a to-do list on my phone but found I would often write it all down on my paper calendar as well. 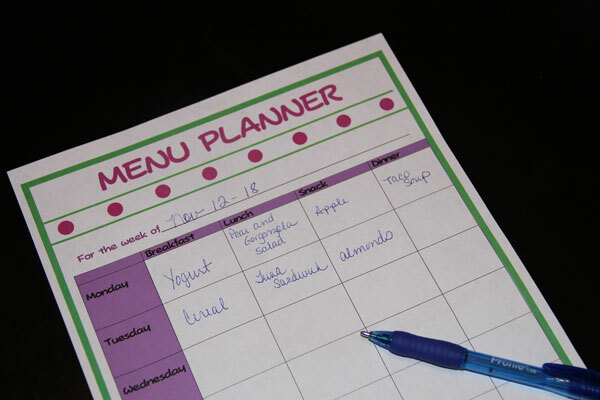 On Jan 1st, one of my favorite organization bloggers, Jen from Iheart Organizing, wrote about a planner she created for herself. I was totally smitten with it. You can see and read all about it by clicking here. 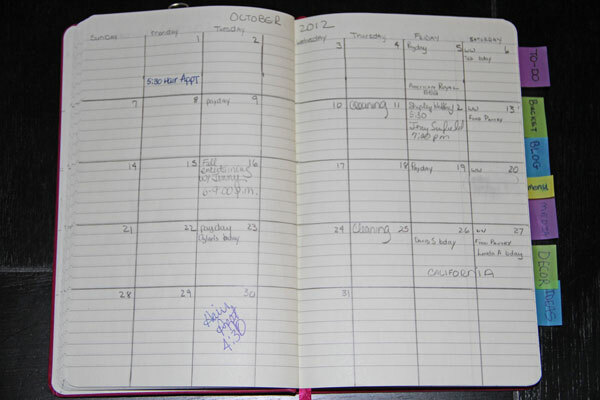 She is also selling her planner on her ETSY site which you can access here. Since I have been playing with design projects in photoshop lately I thought I would attempt to create my own version that fits my lifestyle. I started by creating a monthly calendar. 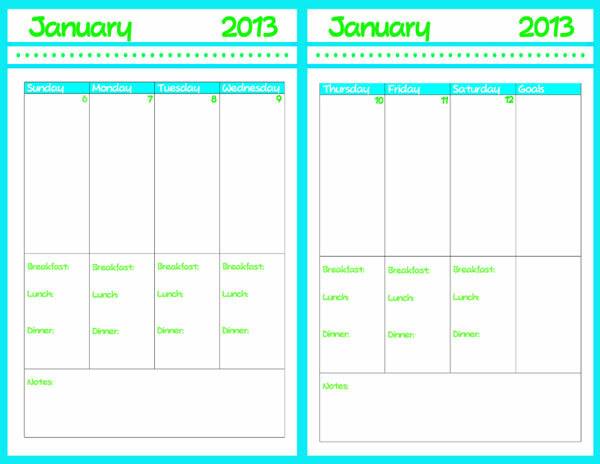 Then I created week-at-a-glance pages. After I finished the calendar section of the planner I decided to add a few other pages for some of the other lists I keep. 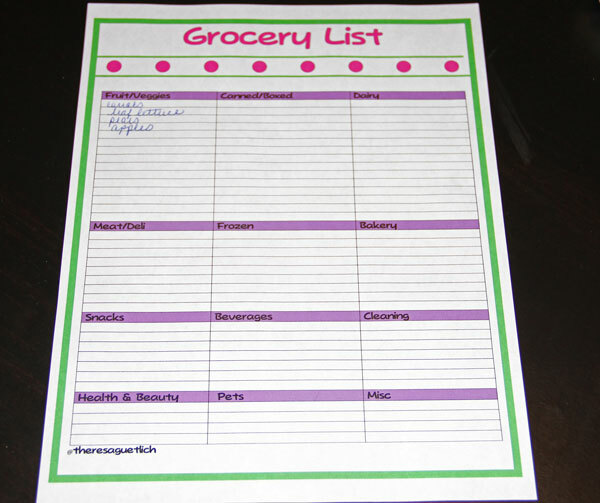 I also added the menu planner and grocery list pages I wrote about earlier. You can see those by clicking here. I really wanted to put them all in this gorgeous Martha Stewart binder but they are all currently out of stock so until I can find one I just bought an inexpensive 3-ringbinder. I added a few labels from from trusty ten year old Brother P-Touch label maker and viola I have a new planner. I am enjoying it so far! 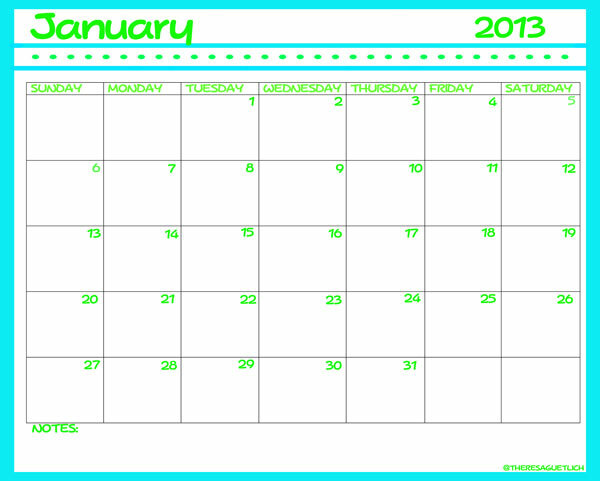 If you can use a 2013 calendar for your fridge or bulletin board, or even to put in a binder, feel free to download this printable I have attached below. Just click on the link and print it. Have a great day! I have written about my list making obsession enthusiasm before. Click here for that post. Lately I have been looking for an electronic tool that would handle all of my list making requirements. I have tried keeping lists in excel, in word, on paper and using the Outlook Task Manager. 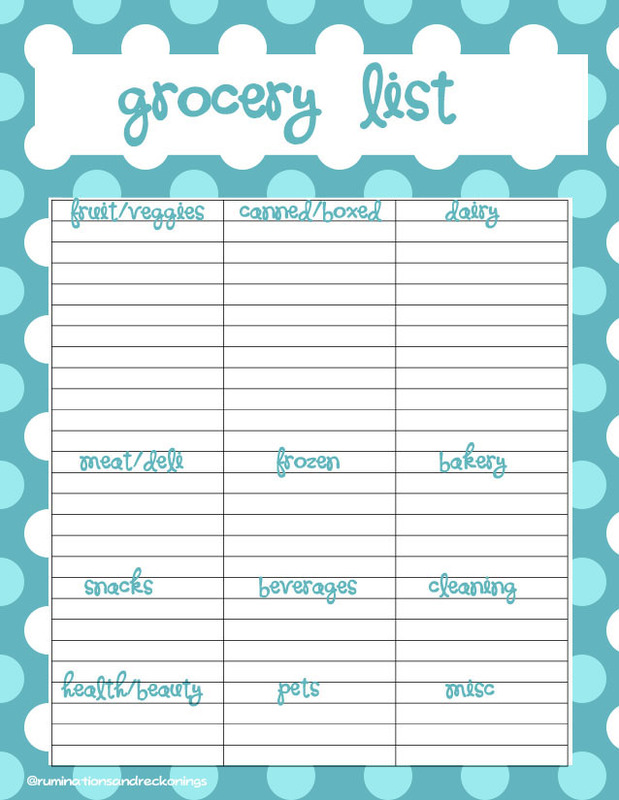 I have also tested several blackberry and kindle fire apps such as Better List and Out of Milk. Although several of those solutions were adequate, nothing has swayed my opinion enough to be my sole list making tool until now. You can create multiple lists. You can put a date on your item, or star it as important or just say Today, Tomorrow or Within 7 days. My second favorite feature is the ability to create notes about your list item. 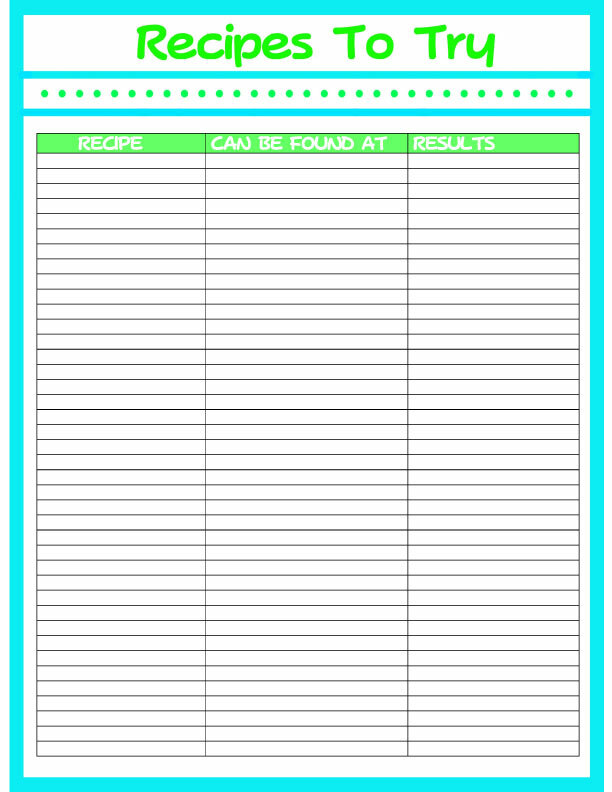 For instance, I have a list called Recipes to Try. 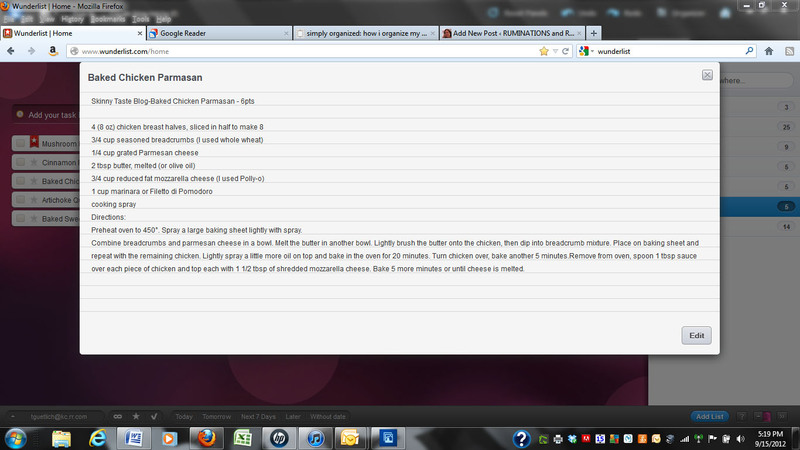 I can select the note icon to the right of the task and actually type in the recipe. 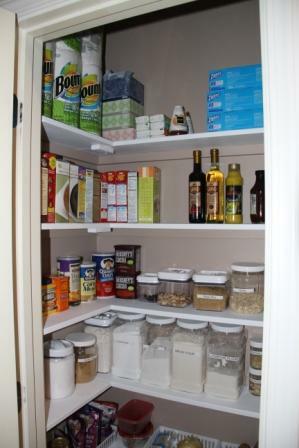 Then when I am at the store I can just check my blackberry for the ingredients for this new recipe. 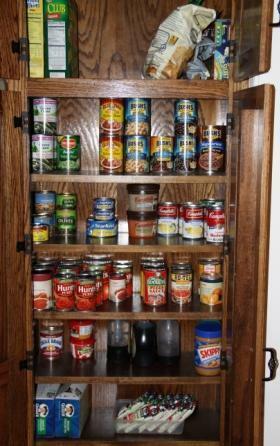 When I am ready to prepare it I do not need to search around my office or on my computer for the recipe instructions, I will know exactly where it is. You can also share the list with anyone by sending them an invitation, or if they are already using Wunderlist they can just synch on their devise. 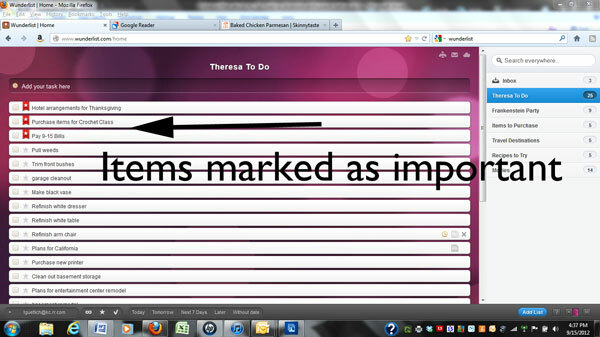 This will come in very handy when I create my list of tasks for Dave to do. I am sure he will be so happy about that!! 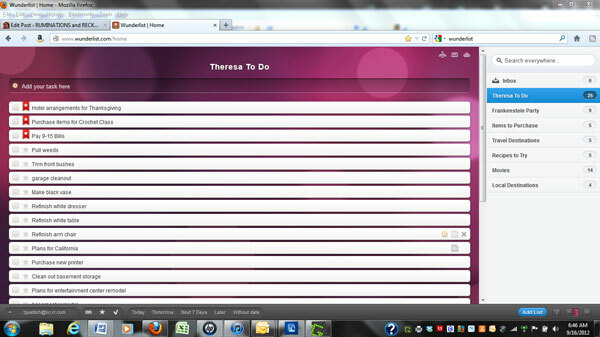 You can also send tasks by e-mail and even print out your lists. I am just getting started using Wunderlist but I can honestly say I have not seen another product that is this easy to use and has all these great features, not to mention that is is absolutely free!! 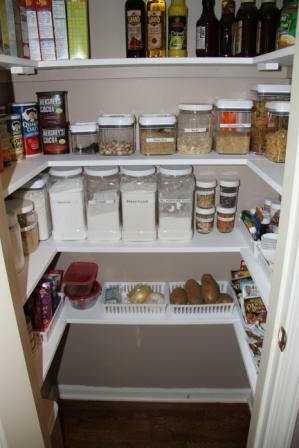 If you are looking for something to keep you organized I would highly recommend this product. It supports multiple platforms including mac, windows, iphone, ipad, android and blackberry. If you do decide to try it, let me know what you think. I am sure you all have similar tasks to accomplish over the next couple of weeks. Most of the time I would tell you that I prefer having many things on my to-do list than nothing at all, but this time of year the “have-to-do’s” seem to outnumber the “nice-to-do’s”. 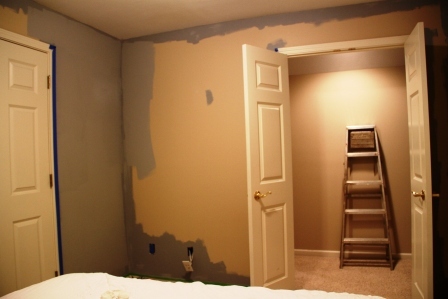 It also does not help the situation when you start a guest room makeover two and a half weeks before Christmas. Since my youngest left for college the pace of my life has definitely slowed. 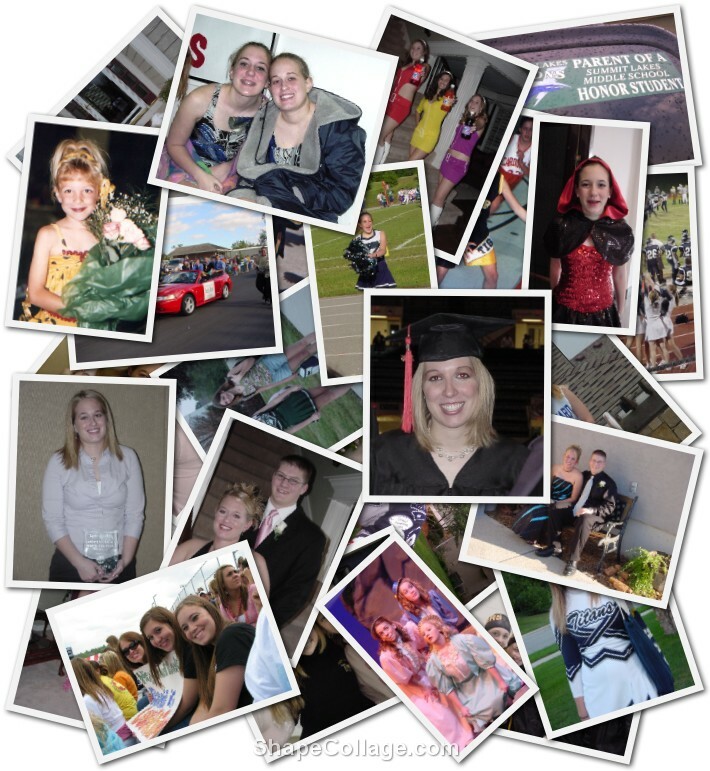 The twenty years prior to that I was in constant motion, working full time, traveling (one year I went to Europe nine times) and raising three girls who participated in many activities including soccer, competitive swimming, band, orchestra, high school swimming, dance, theatre, competitive dance, cheerleading and other things I am sure I have left out. Somehow my husband and I even both found time to get our masters degrees. Now, even though I am still work full time, my evenings tend to be a bit more quiet and relaxed. I have defiantly grown fond of this new lifestyle which is why the frenzy of the holiday season is making me feel totally out of control. Those of you who know me well can attest to the fact that being “out of control” is not a pretty place for me. I get anxious, cranky and a little crazy. My solution to this madness is to resort to what always makes me feel better……list making!!! I have talked about my list making obsession before (click here to see a prior post) so this should not come as a surprise to you. For me, it is the only way to get through the holidays. There is nothing like a good project plan to raise my spirits! 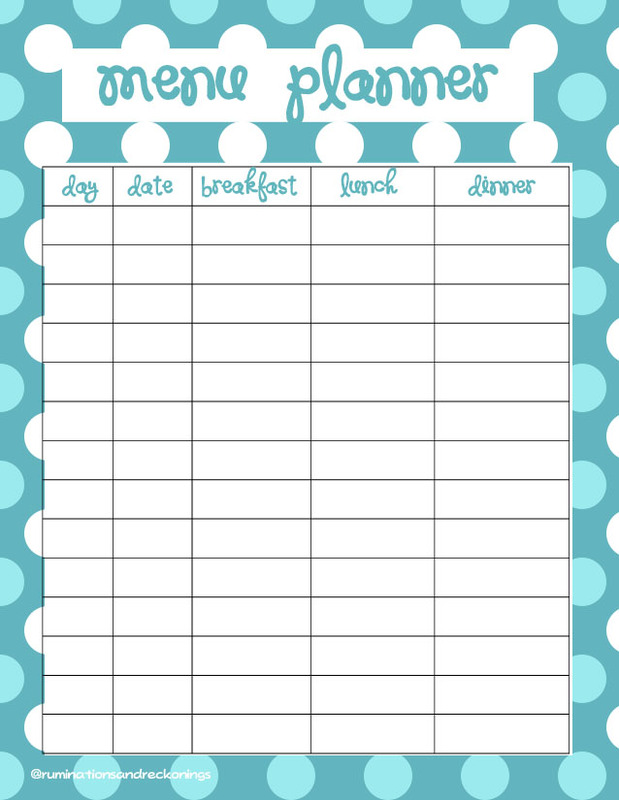 After filling up the rows with all the tasks on my plate over the next thirty dates, I then sort them by Due Date. 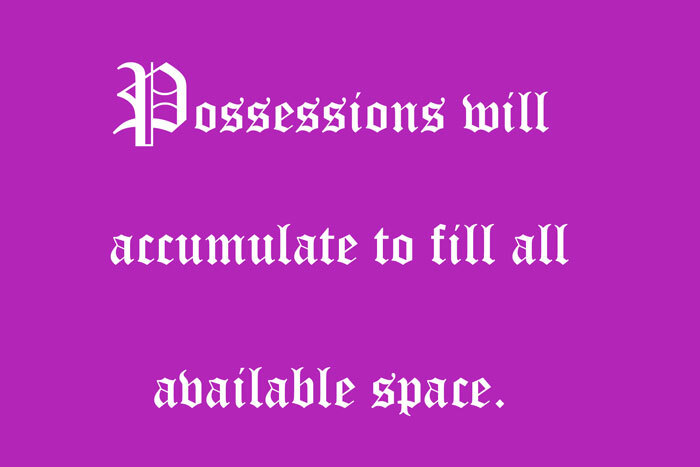 Although you cannot see it here, I highlighted the header column green and used a cute font with red lettering for the title just to make it look festive. Here is a peek at the first few days, the actual list goes well into January. I have organized and controlled my work life and personal life for so long using this method that I am pretty sure I would not know where to start without it. The presents I wrap may not all have fancy bows on them and I may not get 10 different variety of cookies made but I can guarantee you that everything that actually gets on my list will get done. It’s just the way I work! I would love to hear your secrets for getting through this time of year….. Besides my other profession of “worrier,” I am also a “list maker.” I make lists for everything. I make list on my computer in both excel and word (cannot decide which is better), I make list in the journal I carry around, I make list in my blackberry memo app and I make list on those little yellow post it notes. I make list for myself and often for my loved ones, although not sure how appreciated those are. I use lists to bring control and order to my life. 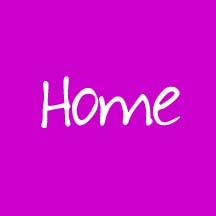 Dave’s To-Do – I frequently provide Dave with a copy which he quietly takes from me with a smile. I have no idea what he does with those lists but I am pretty sure he never looks at them again. Movies to Watch – this list has moved to my recently opened Netflix que. Bucket List – sort of like my to-do list but with a broader horizon – currently contains many places I would like to visit and activities I would like to do. 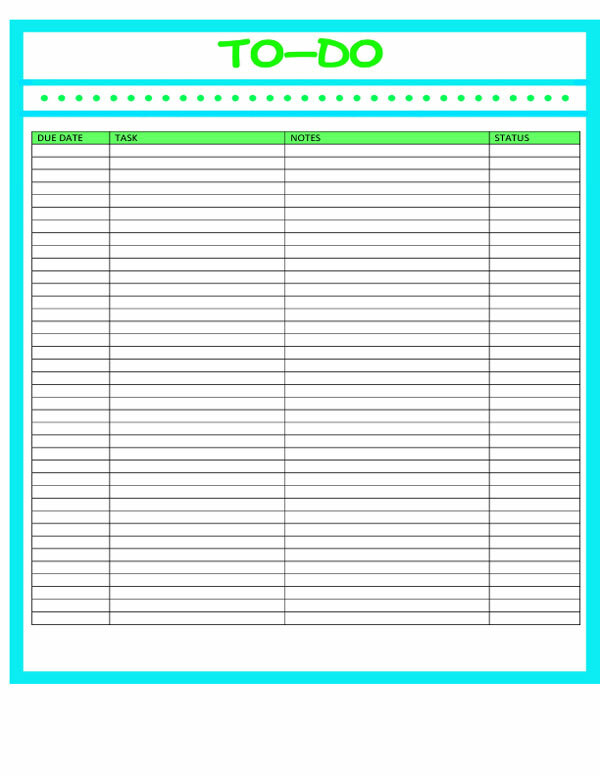 Spring Cleaning Tasks – When all the girls lived at home I would assign each of them tasks along with a box for them to check off when complete. I know they just LOVED this one. Christmas Presents to Buy – of course this included a sub-list of Christmas presents bought. Thanksgiving and Christmas Day Dinner Plans – incorporating menus, shopping lists and hour by hour execution plans. No doubt the highlight of my list life to date was the planning of my two daughters weddings. We had list for about everything you can imagine. One of those daughters may be just a bit more obsessive about this than I am (if that is possible) and I think we actually had some conflict over who was keeping the list for what. Wow, I just realized I now have a list of my lists………cool. ANYWAY, what I started this post about, before I became a little giddy talking about all my lists, were all the things I want to do in my life. I am a much better planner and strategic thinker than I am an actual doer or executer. Many times I blame that on my limited mobility. For instance, I would love to participate in the Arthritis Foundation walk at Zona Rosa on May 22. It is on my bucket list and I really hope I can do this someday. Unfortunately, right now I would have a hard time making it to the starting line from the car, let alone walking the 5K. I often use my list, especially my bucket list, to help with my increasing level of frustration and depression over not being able to participate in certain activities. I read the list, add items to it and look forward to the day I actually may be able to partake. I search for hope and thoughts of better days wherever I can. Are any of you out there list makers? I would love to hear from you (and maybe start a therapy group)! Thirteen days to go……..